Most people have the ingredients to make Cinnamon French Toast in their house but they might not know how to make it. Believe me making Cinnamon French Toast is so simple you will be making if often like we do in the Canadian Budget Binder house. Breakfast foods for most people consist of muffins, oatmeal, bagels, cereals, smoothies, fruits, yogurt, eggs, bacon, ham, sausages, hashbrowns, toast and so on. Sometimes it’s nice to go the extra mile and splurge to make french toast or even pancakes. I’m sure many of you out there will admit to eating breakfast on the run most days but it really is nice to sit down to a proper breakfast to savour the wee morning hours before work or on the weekend. I’ve had oven baked french toast before and it’s good as well but it will take you a bit more time. This recipe is for the speedy person in you especially if you have a crowd of hungry eaters waiting at the table. Our son is now a year old and once in a while we like to make what we call back in the UK, ‘Eggie Bread’ or in Canada, French Toast. 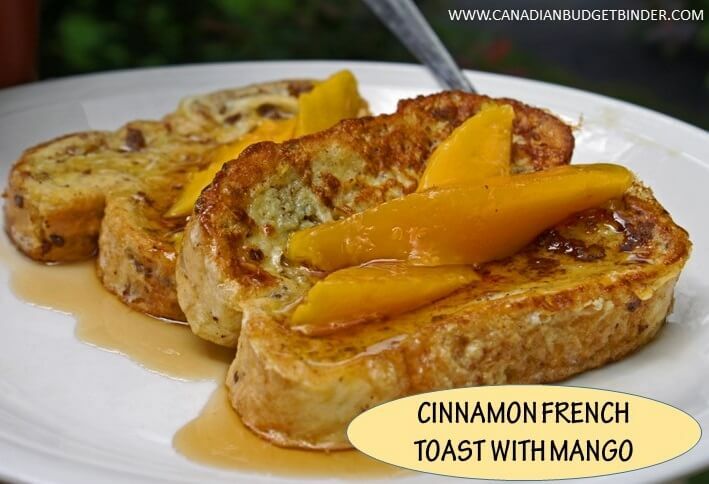 He loves fruits especially mango so I went ahead and created this delicious yet simple Cinnamon French Toast with Mango Slices smothered in Canadian Maple Syrup. We’re fortunate to have a family member who is able to make homemade maple syrup every year so we don’t have to buy it at the grocery store. It can run you anywhere from $9.99 a litre or more depending on what brand you purchase. It’s not cheap but it sure does pack a punch. I don’t know anyone who doesn’t drown their pancakes or French Toast in maple syrup because you want every bite to be saturated with flavours of the French Toast and the maple syrup. Sometimes my wife likes to use Agave Maple Syrup in place of regular Maple Syrup which tastes nice as well. You can find Agave Maple Syrup in the organic section of most grocery stores or at the Bulk Barn. I’m not a fan of sugar-free syrup but if you fancy using that it certainly is an option. Some people opt out of using syrup and prefer a fresh fruit compote and yogurt on top of their French Toast. It’s entirely up to you. My Cinnamon French Toast takes about 10-15 minutes to make from start to finish so it’s a great breakfast to make on special occasions or even a weeknight dinner. The best bread to make french toast is to use a thick whole wheat or white bread that will hold up to being saturated in the cinnamon egg bath. Alternatively, you can use homemade bread or a cinnamon raisin bread. Once I make the cinnamon, egg, vanilla, milk bath I let each piece lay inside it for a minute or two to soak up as much of the mixture as it can. This makes for a lovely rich Cinnamon French Toast. Once the bread is soaked I make sure my griddle or frying pan is nice and hot with a tablespoon or two of melted butter sizzling before I lay the bread in it. The key to making the best Cinnamon French Toast is to make sure there is enough butter in the pan, a hot pan and that you don’t flip it until it’s golden brown. I like to leave the temperature dial around 7 out of 10 on the stove-top which seems to be hot enough. If I’m using the griddle which I prefer especially for making pancakes I will keep the temperature around 200 degrees. As soon as both sides of the Cinnamon French Toast are golden brown I lay them on a plate, add slices of mango and lots of maple syrup. The best time to eat Cinnamon French Toast is as soon as it comes off the griddle and onto the plate. You don’t want to let it sit around as it will get soggy and you will miss all the wonderful texture that you created. Making Cinnamon French Toast with Mango slices is so easy and fast that you can easily whip it up when you want something sweet for breakfast or any other meal of the day. Get the griddle hot to about 200 degrees or your pan at 7 on the dial. Add in your 2 pieces of bread and let it become golden before flipping it to the other side. Add more butter if your griddle is dry or you won't get that golden look and lovely texture. Once off the griddle add maple syrup and your mango slices then serve. I hope you enjoy making my Cinnamon French Toast recipe which is one of our monthly treats and I hope you give it a try and let me know what you think. Oh yum this looks so good! I love mango, will definitely give this one a try! In response to your request about the operating systems we use; I use Internet Explorer or Chrome. I thought mango was only perfect for crepe. But, when I see the Cinnamon French Toast With Mango, oh my it looks so delicious! I imagine how flavorful the mango is and how it blends with the French toast. Perfect combination! French toast here would be a brunch or lunch meal!! Last time I made it I was lucky enough to find a nice big loaf of the expensive artist bread on the reduced rack. I got it a couple of days ahead so it was nicely stale for the French toast. It soaked up the egg mixture nicely but still held it’s shape without getting soggy like some breads can….it was so nice for this!!! I still look over the rack for another loaf to use for making French toast, it worked so well! !